My first ever visit outside of North America was a New Year’s tour of London and Paris. This was over the last week of 2001 and the first week of 2002. I acutely remember the year as it was the day that the euro bank notes came into use; all of a sudden, all the notes anyone had were 20 euros, making it difficult to buy all those fantastic sweets. I bring up this story as it relates to the French penchant for being gourmands. All those pastries, chocolates, and fantastic bakeries, they titillate the pallet. I’ve had Greek food – it is great. But come on, are we really going to compare Parisian bakeries to a small town on a volcanic island where they don’t even have water (it has to be shipped in!) Santorini does score great points for fantastic sunsets, panoramic views and the romantic lifestyle. 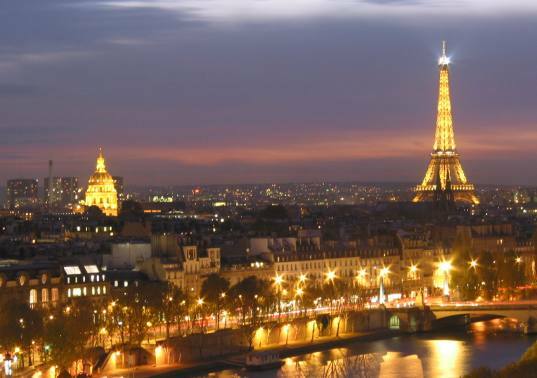 But Paris is the city of lights and lovers; if you were on honeymoon would you want to risk a volcanic eruption to stay on a tiny island in the Agean, or save the “volcanic eruptions” for those Parisian nights out on the town? Enough said. Vive la France! Warning: Bracket Buster alert! In one of the biggest upsets of the entire tournament, a dirty, rickety, outdated transportation system knocks out that great multicultural harbinger of finance, business, and worldly affairs. The British Foreign Minister has called for an inspection, citing claims of “red threats” that have bribed the officials. Lord George Nelson had this to say “quite frankly, everyone knows of the splendor of London. I think we had all envisioned a good old French-English final, where we had hoped that the ghosts of Waterloo would rear their ugly heads again. To think that these dirty vodka swigging Russians would defeat us, well, bullocks. It is simply unheard of.” The Russians were contacted for comment, but were found passed out on vodka with Kalashnikovs hanging from their bedposts. In any case, the world is aghast at this result as Londoners now feel what it is like to be Chechnyan. In a strange turn of events, first round losers, The Vatican, have snuck back into the tournament by appealing to the International Court in The Hague. Catholic officials argued that their first round defeat to Dracula’s castle were mere folly, everyone knows that the Vatican – although a separate sovereign state as the Holy See – the Vatican is simply another neighborhood in the city of Rome, as far as tourists are concerned. The Hague seemed to agree, and ordered that Rome take on the Vatican for purposes of the remainder of the tournament. With their inclusion into Rome, Dracula’s Castle had to replay their first game against a newly added opponent to the European Region – The Isle of Skye in Scotland (more on this below). Furthermore, The Hague heard arguments that Rome’s second round opponent, Versailles, was little more than a neighborhood of Paris. As Versailles officials feared that it would be incapable of competing against the newly created Rome/Vatican super team, Versailles accepted this argument and agreed to join the Paris team, who was all to happy to take on the Versailles players. As such, Versailles’ victory in Round 1 was nullified, and Vienna was chosen as Rome’s second round opponent. In any case, the Habsburgs were already on their way home when news reached them that they had reached the 2nd round. Throwing together a last minute team proved to be fatal to the Austrian outfit, and they loss easily against the might of the Italian capital. Romans were seen to channel the ghosts of their ancient empire, when such barbaric Germanic tribes were easily quelled by the legions of roman soldiers. Through all these legal and on-the-field battles, it is difficult to assess how Rome will fare in the next round, although one thing is certain, they are a force to be reckoned with, having incorporate the Vatican, beaten Vienna, Stonehenge and causing the removal of the team from Versailles. In a strange twist, the first round match-up between the Vatican and Count Dracula’s Castle was replayed the following day when The Hague intervened and ordered the Vatican to join the team from Rome. As such, the victory by Dracula’s Castle was nullified and tournament officials had to invite an outside competitor to be their new first round opponent. They decided on the Scottish Highlands, that beautiful rugged countryside with spectacular landscapes, vibrant Scotsmen and lush flora and fauna. As the game was played during the following day, an even stranger thing occurred – Count Dracula’s Castle did not show up for the game. I am not speaking euphemistically; they literally did not show up. Later, it was learned that the team has an “aversion” to sun, and claims that it cannot play any day games. When questioned further, Dracula officials refused to give any further information, and vowed they would have their revenge, cryptically warning both tournament officials and Scots to be aware of inviting strangers into their home. In any case, this set up a 2nd round match between the Isle of Skye and Moscow’s Red Square. The Russian team showed up with garlic around their necks, as scouting reports seemed to suggest this would be beneficial against Count Dracula’s Castle. In fact, the entire Russian team seemed thrown off by the appearance of the Scottish team, as they had expected a much different opponent. The Isle of Skye, having yet to actually play a game, were simply happy to be in the tournament – their effervescent and laissez-faire attitude seemed to serve them well, as they were relaxed and lose, hitting 3 pointers throughout the entire game, leading to their eventual upset. Russian officials were not too upset, as the evening prior, they had been up all night partying the victory of the Trans-Siberian Express over London. The team from Moscow conceded that the U.K. was not that bad of a place, and that they probably deserved a representative in the Regional Semifinals; they were particularly pleased that it be a Scottish team rather than an English one. No word on the case of how these remarks were affected by the case of Scotch found in Moscow’s dressing room after the game.